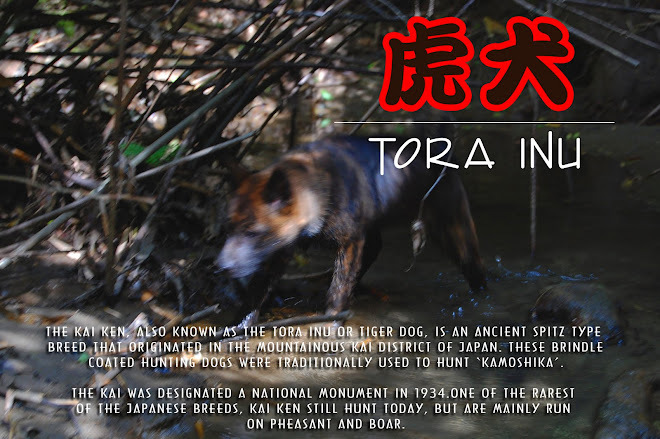 Kai Ken: The Tora Inu: Happy New Year! Spent the 1st with my wife's relatives, lots of great food. On the 2nd and 3rd headed out to the mountains. Brought in a 35kg pig and had some great 'yakiniku'. We went for a bit of a trip on the 4th to meet up with Taro, one of Baron's littermates. Taro is nearly twice the size of Baron, and an all round happy go lucky friendly pup. We had a nice walk up in the mountains with Haru, Baron and Taro, and they had fun playing around. Baron wasn't so happy with the black Labrador, and kept growling at him, he tends to get that way with certain dogs. On the 5th I went down south to my brother's place and we took Haru out for some training. She flushed a pig at the end of the day, and all in all it was a good experience. The cats and Haru seem to all have upset stomachs at the moment, so I'm pretty frazzled. cleaning up after them. Baron had a reaction to his second vaccination last month, and was sick for a few days afterwards. He lost quite a bit of weight there, but is doing fine now. Funny that now I have 2 dogs that have issues with vaccinations. Will have to give this some thought. Anyway, HAPPY NEW YEAR ALL! Thanks for coming over, Shigs! Hopefully you'll actually get something next time I go with you. Thanks for making the trip over to my house. It was great meeting you and getting the dogs together!